The semi instant hijab is called Zarith and Zaila. With just one loop and a wrap, you’re basically done! It is as simple as that. One end is stitched and another end has pleats and the detailing is breathtaking once it is wrapped around your head. It’s a semi instant hijab that’ll help to pull your entire look together, an understated design that speaks volumes in terms of chic and elegance. Using heavy chiffon is definitely a great idea as the fabric allows beautiful drapes and flows no matter how you style it. Both mother daughter designs are available in beautiful 20 colors to choose from. 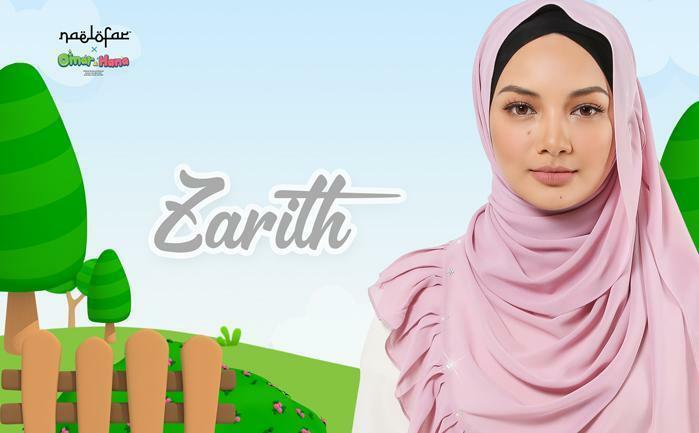 For the mother’s hijab, Zarith is blessed with 47 sparkling Swarovski crystals and white pearls for some extra raya glam.